Remember Shadow Brokers, the shadowy hacker group that made headlines in August 2016 when it leaked advanced NSA hacking tools. Shadow Brokers had claimed that it had access to whole range NSA hacking tools and had attempted to sell some of the tools on the dark web. 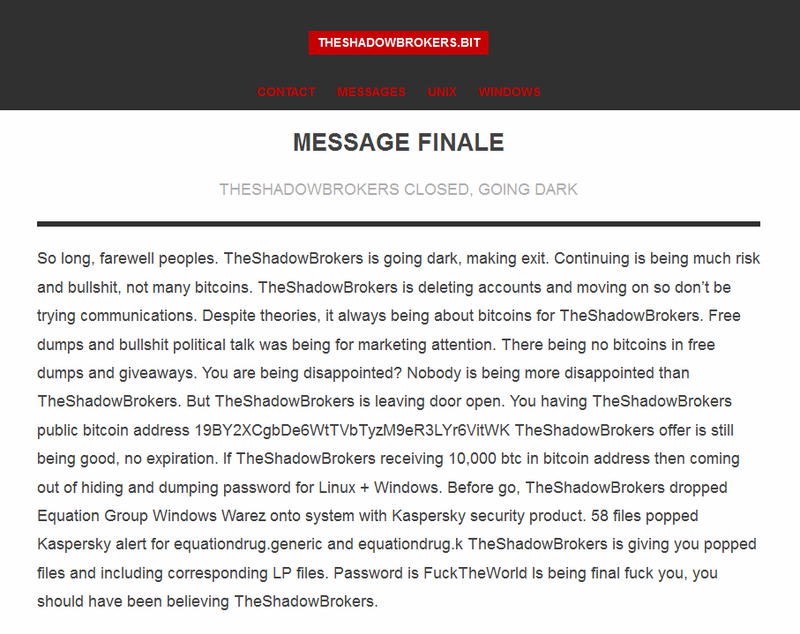 After failing to get buyers for the hacking tools, Shadow Brokers today announced its retirement. The hacker group said it was “going dark”, but not before leaving a parting gift. It leaked a full set of NSA-linked Windows hacking tools freely to the public. The group published a tweet today and an article on their website, hosted on the ZeroNet anonymous hosting service. The message left by the group reveals their frustration at not being able to sell the stolen hacking tools and exploits. Shadow Group had claimed to have stolen all the hacking tools from the servers owned by The Equation Group, a nickname given by security firms to the NSA and its foreign cyber-espionage operations. The group, however, has not completely abandoned hopes of selling the stolen NSA cyberweapons. In their message, the Shadow Brokers said they will still keep open their offer to sell a batch of Windows hacking tools for 750 bitcoins. The group also publicly released an archive with 58 Windows hacking tools, currently already detected by Kaspersky antivirus, which can be downloaded from their website. “Password is F**kTheWorld Is being final f**k you, you should have been believing TheShadowBrokers,” the hacker group said. 61 files in new #ShadowBrokers dump, 18 claim to be from Microsoft (not signed). Other 43 have no publisher information. Of the 61 files in the new Shadow Brokers dump, only 74de13b5ea68b3da24addc009f84baee was in @virustotal before today. NSA and the US intelligence community will breath a sigh of relief to see the back of the mysterious hacking group which had given its top honchos plenty of sleepless nights. I have tried to decrypt the files with Kleopatra on windows with given password but no luck and decryption and extraction fails always, please guide me to decrypt the folder/files. Anyone know the password ? ?